I first became familiar with the concept of overnight oatmeal when I started reading the blog Carrots n’ Cake. It’s a great way to make a healthy breakfast ahead, then the next morning, grab it on your way to work or school. Here’s how it works, when you empty a jar of peanut butter or almond butter instead of throwing it away mix oats, milk, and assorted mixings in the jar. Close the lid and set it in the fridge overnight. The oats absorb the liquid and mix with the leftover peanut butter leaving you with a healthy delicious breakfast the next morning. After making Salted Nutella Fudge, I had a jar left over. Since I’m absolutely obsessed with Nutella and can’t stand to throw even the last remaining bits away, I decided to give my own version of overnight oats a try! 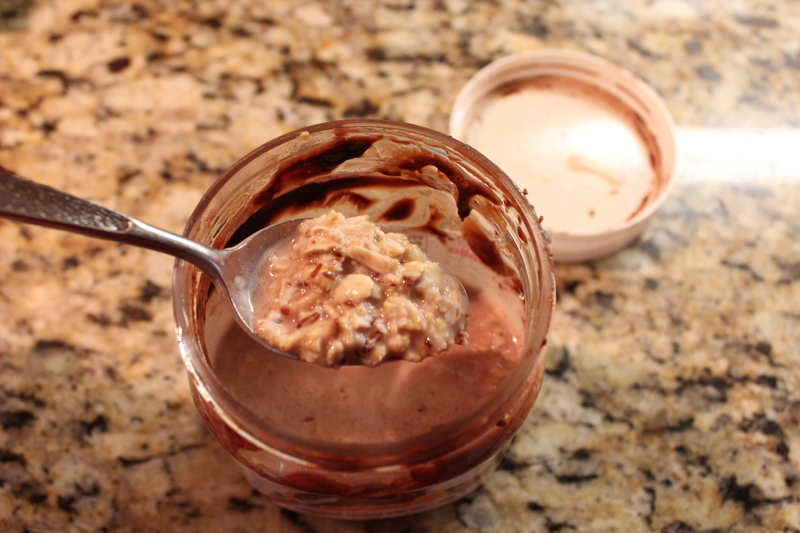 Mix all ingredients together in an empty Nutella jar then set in the fridge overnight. Can be eaten cold or hot. Enjoy! Yum! This might convince me to eat oatmeal again! Are overnight oats kind of soupy?? Or am I just adding too much milk? I just love your recipes. This is so me. I can’t wait for my peanut butter jar to run out and now I have to buy some Nutella! I love hints for using up odd bits of stuff. Fun idea, looking forward to trying this! This is the best idea ever! I love oatmeal, I eat it for dinner sometimes 🙂 I’m definitely going to give this a try when our peanut butter jar is empty, which is very soon, yay! Thanks for the great idea 🙂 Happy New Year! Hey Julie! They are as soupy as you want them to be. You just need enough liquid for the oats to absorb. I’d start with 1/2 liquid, 1/2 oats and then adjust until you’re happy with how it turns out! I personally don’t like soupy oatmeal either- there needs to be something in each spoonful for me! I have never made overnight oatmeal. What a perfect idea! I always have empty bottles of peanut butter however I think Ill have to buy a jar of nutella for this. I think I can find some things to make with it so I have the empty jar! How creatively cool is this! Now I am ready to empty the peanut butter jar just to try it. Great way to get more grains in my diet and not be bored with plain oatmeal-yum! I just might eat oatmeal this way. Sounds more like dessert! Oh my goodness! Nutella Oatmeal!!! Brilliant!!!! !